Pollen is the sole protein source for the honey bee colony. They must have protein to raise baby bees. No pollen – no babies. Under normal conditions, foraging worker bees collect pollen from blooming plants. The pollen is mixed with saliva and enzymes – converted into “bee bread” and stored for later use. But, there are occasions when the honey bee colony runs low or even out of stored pollen. 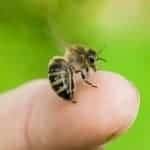 By providing a protein source, such as pollen substitute or “pollen patties”, the bees can continue to raise brood or baby bees. The task of collecting, drying and storing fresh pollen is time consuming. Most beekeepers use a pollen substitute to feed their bees. This high protein substance is a mix of several compounds (not real pollen). And several commercial varieties are available for purchase. We all have favorites but I doubt it really matters as long as you purchase from a reputable company. Many beekeepers would rather purchase pollen patties that are ready to use. This is perfectly okay. Just be sure that you choose a supplier who is reputable. When it comes to feeding things to our bees – cheaper is not always the best deal in the long run. These patties can be frozen and thawed for use as needed. The dry pollen substitute can be put outside. Place it somewhere protected from rain, skunks, dogs and barn cats. The bees will find and collect it.I find it very endearing to watch my bees collecting the pollen substitute. But they can only collect it when the weather is warm enough and dry enough to allow bee flight. And, you can make your own dry pollen feeder! Here is the link to how I made mine. DIY Feeder. Ultra Bee from Mann Lake is currently my favorite dry pollen substitute. The bees really seem to like it and collect it well from my homemade pollen feeder. Good pollen substitute is not cheap. But it lasts a long time if you use it correctly and do not put out too much at one time – resulting in waste. The answer to the weather dilemma is to make a pollen patty that can be placed inside the hive . 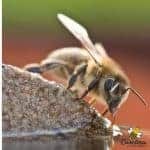 The bees have access to their protein source 24/7. In order to encourage the honey bees to consume the patty, all recipes contain sugar as one of the ingredients. 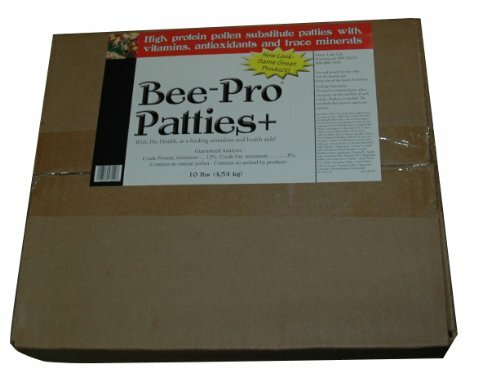 You can order pollen patties from all major bee supplies. And, everyone has a different idea or recipe of exactly what is the best mix. You will find some that are especially formulated for over-wintering and are called “winter patties”< But, most will simply be a protein patty. They come in a rather large size. Do not be afraid to cut them into smaller pieces. Perhaps you are like me and want to make your own. It’s actually rather easy and you don’t even need a recipe for pollen patties. I mix water. cane sugar and pollen substitute to reach the desired consistency. My favorite method of making pollen patties is to start with the dry pollen substitute. Currently, I prefer “Ultra Bee” from Mann Lake. But, I have also used “Mega Bee” from Dadant and “Bee Pro”. Again, I doubt it matters as long as it is good quality. Mix pollen substitute with a smaller quantity of cane sugar and add water. That’s it. You can adjust the ingredient amounts until you get the consistency you desire. 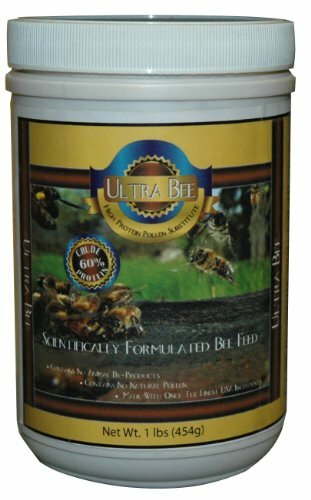 I usually add just a bit of “Honey B Healthy” or other honey bee food supplement. That’s optional. Place the patties on the top frames directly over the cluster of bees. They can be spooned onto small squares of wax paper (or several layers of newspaper). I prefer to roll my protein mixture up into a “pollen taco” with wax paper. 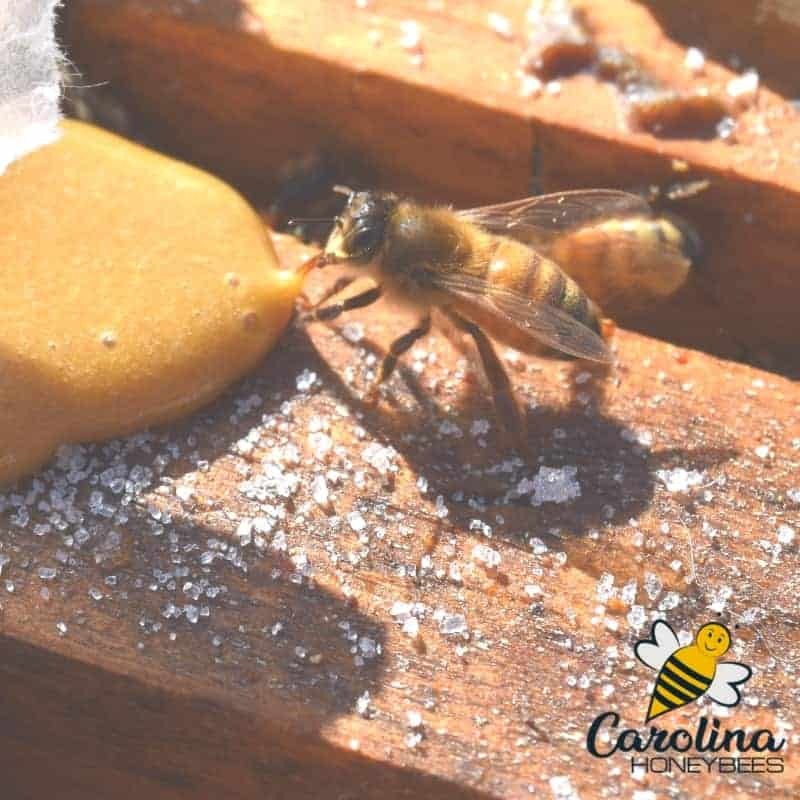 The honey bees can easily chew through the wax paper and it keeps the mixture from drying out too fast. It is important that we place the protein patty close to the brood nest. Our bees will be able to access it even on rainy or cool days. How Many Pollen Patties Should I Give the Hive? The decision of how many or how large a patty to put in your beehive depends on several issues. Most importantly this will refer to location. This is due to the honey bee pest known as “Small Hive Beetles”. Small Hive Beetles LOVE pollen patties too! If the bees do not consume all of< the patty within a short period of time, beetles will lay eggs and raise young. This is not good. Because I live in an area with Small Hive Beetles, I am very cautious. I use small patties and replace them at regular intervals (if not consumed) and never use them during the warm Summer months. Smaller sized patties are easier to handle. When to Feed Pollen Patties? Feeding pollen patties during the warm months is not advised in areas with Hive Beetles. I only feed them during late Winter – Early Spring. This is the time of year when a colony is ramping up brood production. It can easily run low on pollen reserves. This is especially true if pollen collection last Fall was difficult. In very early Spring, we normally have enough mild days to replenish the protein source if needed. This helps my over-wintered colony build up a good working population in time to make honey. When to Stop Feeding Pollen Patties? Honey bee colonies that need the protein will consume the patties. I remove them when the weather is warm (Hive Beetles). And, the bees usually have a lot of natural pollen available to collect. They prefer that anyway – can you blame them? Realize that every action has a result. Feeding pollen patties to stimulate growth will most likely, well, stimulate growth. Be sure that your bees have enough honey/food to feed all these hungry mouths. When you have patties or dry pollen substitute that you do not need to use soon, freeze it. Both freeze and thaw easily and can be stored for months. Feeding bees pollen patties is one method of helping a colony grow and reach its full potential. Is this something that you have to -or should do? No – not usually. Do all honey bee colonies need to be fed pollen patties? No, some will have plenty of natural stored pollen. This is just another one of those beekeeping management tasks to learn. You can adjust it to the needs or your honey bees and your location.